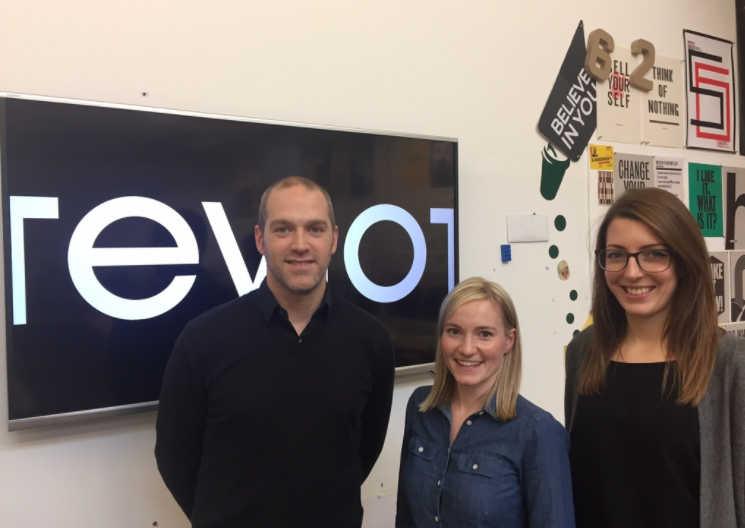 Teviot, one of our partner design agencies, has launched 'Firestarter' – a year long paid internship for a creative student from our Visual Communication HND course. The successful student will join the company after they've finished the course in July, and then spend a year under the watchful eye of the creative team at Teviot, working on all sorts of projects and gaining valuable industry experience. The initiative was started by senior designer at Teviot, Kirsten Murray, a former graduate of the course, who has been involved in the mentoring programme since 2010. As well as the internship, some our HND students will also get the opportunity to develop the brand identity for the Firestarter programme ahead of its launch in the Spring. Kirsten (centre) and her colleagues Kat Summers (right) and Ed Vickers, came into the college just before Christmas and surprised the class with the announcement about Firestarter. You can follow progress on the Firestarter initiative on Teviot's website. and read the official press release as published in the Glasgow Herald. We had a very busy few days of guest speakers in the studio last week. With the final year class finishing of their D&AD projects and getting their portfolios ready for their placements, its a very busy time but there is always room for employer engagement, and hearing it from the horses mouth on life outside college in the Creative Industries. First up, on Wednesday, we had Gemma Rundell, who graduated from the HND course in 2009 and is now a designer at Teviot. Gemma is a former YCN winner, and she talked to the final year students about placements. This is perfect timing because the students go out on work experience from the first week in February. This year we've managed to secure every student at least one placement at a broad range of studios and agencies across Edinburgh. Gemma provided some awesome inspiration and plenty of words of wisdom. At the end of the week, former student Craigh Robertson came in and delivered a talk to both HND Graphics and HND Interactive Design on his experiences since graduating in 2015. Craigh worked at Stuff and then at Hookson, before setting up his own business, Hawk, towards the end of 2016. Amongst other things, Craigh discussed how he devised a business plan, sources of support and funding, the development of his brand identity, and pricing work for clients. Our final year graphics students start placements on Jan 30th, and we'll post up a list of the agencies involved soon. A short film featuring feedback interviews with some of our HNC and HND students reflecting on their experiences working on the Highland Park One Week project in Nov 2016.